l'Empire Romain et les Barbares du Nord au IVeme. Siecle et avant la Grande Invasion. 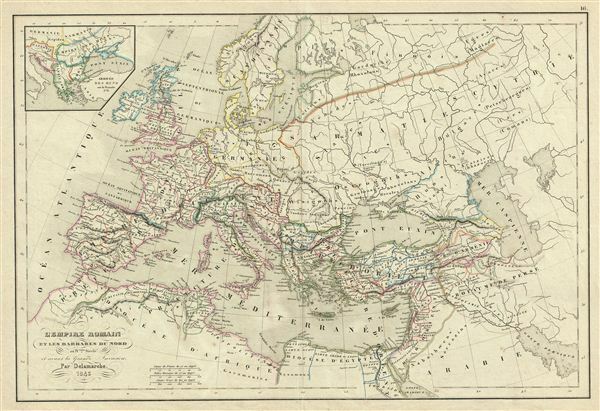 This is a beautiful example of Alexandre Delamarche's 1843 map of europe under the Roman empire and just prior the c. 350 C.e. Barbarian Invasions. It covers all of europe from the Atlantic Ocean to Asia, and from the Arctic to northern Africa. An inset in the top left quadrant details the arrival of the Huns on the Danube in 376. The Barbarian Invasions saw the western Roman empire fall to Goths, Visigoths, and Vandals, and much of central and northern europe taken by Attila and his merry Huns. Some historians now also use the term 'Barbarian Invasions' to refer to the simultaneous and more peaceable migration of Germanic peoples westward, including the first Anglo-Saxon settlement of Britain, when, for all intents and purposes, the Roman empire had ceased to exist. Throughout, the map identifies various cities, towns, rivers, mountain passes and an assortment of additional topographical details. Political and regional borders are highlighted in outline color. This map was issued by Delamarche as plate no. 16 in his Atlas Delamarche Geographie Modern. Delamarche, A., Atlas Delamarche Geographie Ancienne et Moderne, (Paris) 1850. Very good. Some wear on original centerfold. Blank on verso. Minor verso repair in margins.